I am totally STOKED about presenting this cook book to my readers. I am such a fan of her previous two cookbooks and this time, I was lucky enough (and totally honored) to receive a review copy of her newest cookbook prior the release date of September 24. Long time readers of my blog know that I reviewed a previous book of hers on my blog back in 2010 - and she most graciously commented on that blog post. You can imagine just how shocked I was to hear directly from an author - especially an author who I admired. What a kind thing to do!! I never forgot that. 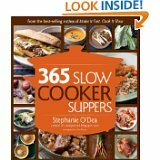 Anyway, when she offered bloggers an opportunity to receive a review copy of her newest book, 365 Slow Cooker Suppers, I jumped at the opportunity! Thank you so much Stephanie. Stephanie O'Dea is a blogger. Crockpot365.blogspot.com. I have a weakness for bloggers. 3rd Crock Pot Cook Book by Stephanie O'Dea (Make It Fast, Cook It Slow and More Make It Fast, Cook It Slow). I have both books and they are great. Book organization: Soups and Stews, Beans, Poultry, Beef and Lamb, Pork, Sandwiches, Meatless and Fish and Seafood. Beautiful photography! Her first two books had no photos. I didn't think that it was a minus, because when I cook, my results seldom looks like the picture. Food photography is an art. It takes a special kind of person to make beef stew smile. There were many smiling foods in this book. This book focuses on suppers only. Perfect!! Most cook books spread themselves a bit thin by having samples of all the possible food options (breakfast, side dishes, desserts, and main dishes). When it comes to the Crock Pot, I am a main dish kind of girl. Throw it all in the crock pot, turn it on and 8 hours later dinner is done. I have never made breakfast or dessert in a crock pot. Those sections of other crock pot cookbooks are wasted on me. Don't you hate recipes that have 25+ ingredients and just as many steps of preparation. Or how about the 3 ingredient recipes ... I get so turned off by the swings of extremes in recipe creation. Stephanie has an average of 10-15 ingredients in a recipe (a few that have more.) In my mind this means this is not an over simplified slow cooker cook book - that uses 3 or 4 ingredients (one being canned soup) and then calls the results "great." Nor is it a recipe that take 30 minutes to collect all the ingredients before you can do anything. I have a few books in both categories and they are heading into my recycling because I never make anything in them. Steph's balance of ingredients and preparation steps are perfect and realistic for the every day cook. In her first 2 books she used "The Verdict" to report family reactions and other observations on each recipe. She has continued this practice in book 3. I totally love these snippets. I feel like the author is talking directly to me ... giving me the inside scoop on this particular dish. Obviously she wouldn't have included recipes that were duds, so you don't have that kind of feedback in "The Verdict." But if you are interested in how well a specific recipe was received by kids and other members of the family, or how light or filling a meal was, or will it freeze well, or kudos to others (with websites referenced), "The Verdict" provides this feedback. To be totally honest, sometimes I read The Verdict before I check out the ingredients. Spiral binding - cook books that lie flat while you are using them are user friendly. I am considering have all three of her books punched for spiral binding at a local office supply store. Nutritional information for each recipe - health and weight conscious folks would really appreciate this added information. Next week I will be preparing two recipes from this book and I will report back on the outcome with pictures and comments. And just for the record, it took me all of about 2 minutes to find those two recipes. In quickly checking out the options for meals, I think I could have closed my eyes and just picked two at random ... they all sounded great!